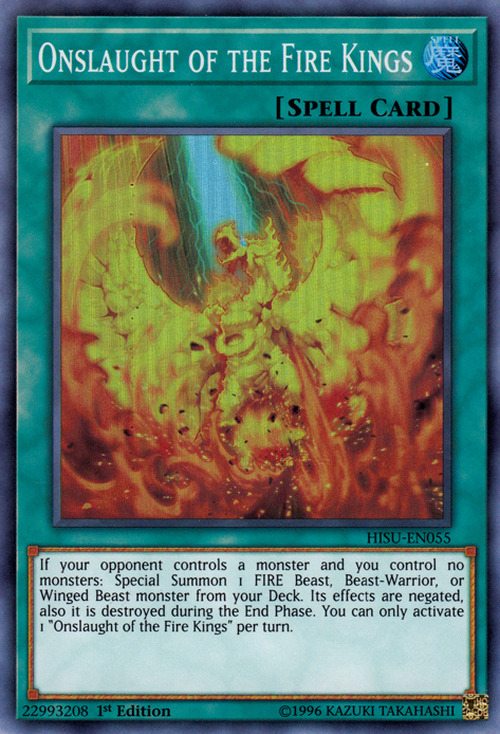 If your opponent controls a monster and you control no monsters: Special Summon 1 FIRE Beast, Beast-Warrior, or Winged Beast-Type monster from your Deck. Its effects are negated and it is destroyed during the End Phase. You can only activate 1 "Onslaught of the Fire Kings" per turn. Fire King High Avatar Garunix appears in this card artwork. This card is similar to Call of the Atlanteans. Both cards' Japanese names are the same as their corresponding Structure Decks. Applying "it is destroyed during the End Phase." does not start a Chain Link. You cannot activate "Onslaught of the Fire Kings" even if you only control face-down monsters. : Can you activate "Onslaught of the Fire Kings" if you only control face-down monsters? If a monster Special Summoned by the effect of "Onslaught of the Fire Kings" is not destroyed during the End Phase because it was affected by the effect of "Forbidden Dress", the effects of that Special Summoned monster remains negated. Also, after the End Phase of the turn in which the monster was not destroyed as a result of the effect of "Forbidden Dress", the destruction of that monster will keep applying during each End Phase. : If a monster Special Summoned by the effect of "Onslaught of the Fire Kings" is not destroyed during the End Phase, what happens? If a monster Special Summoned by the effect of "Onslaught of the Fire Kings" is banished by the effect of "Interdimensional Matter Transporter" and then returned to the field, "Its effects are negated and it is destroyed during the End Phase." is no longer applied. : If a monster Special Summoned by the effect of "Onslaught of the Fire Kings" is banished by the effect of "Interdimensional Matter Transporter", what happens? If a monster Special Summoned by the effect of "Onslaught of the Fire Kings" is changed to face-down Defense Position by the effect of "Book of Moon" and then flipped face-up once again, "Its effects are negated and it is destroyed during the End Phase." is no longer applied. : If a monster Special Summoned by the effect of "Onslaught of the Fire Kings" is flipped face-down, what happens?